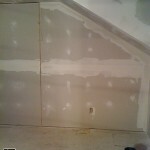 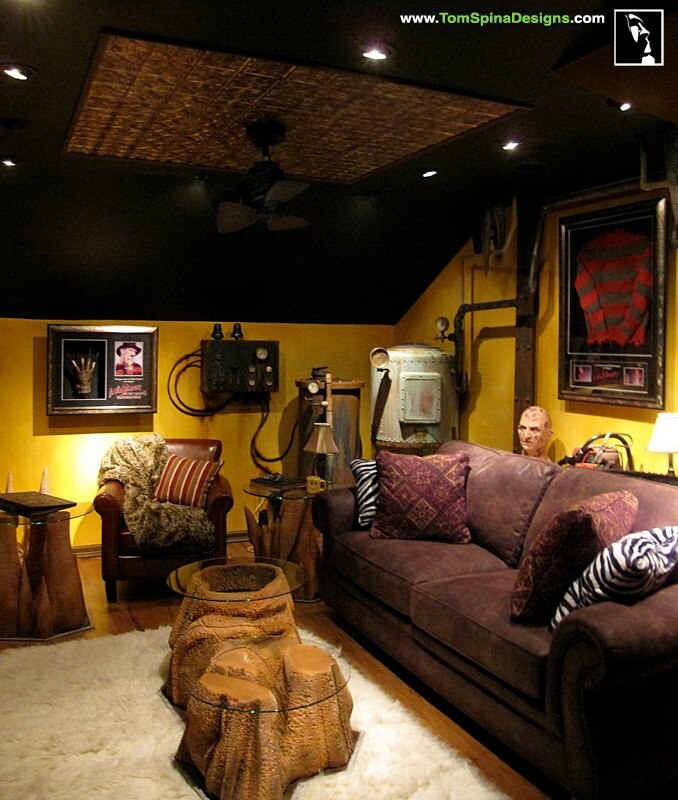 Custom man cave for a client who wanted theme park style in his home! 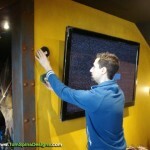 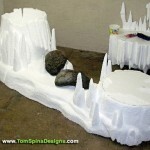 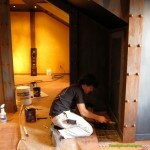 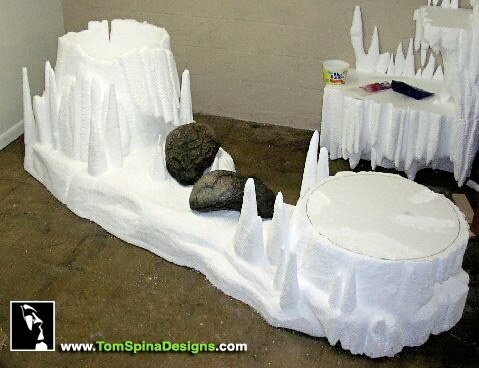 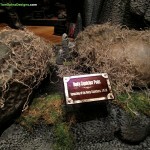 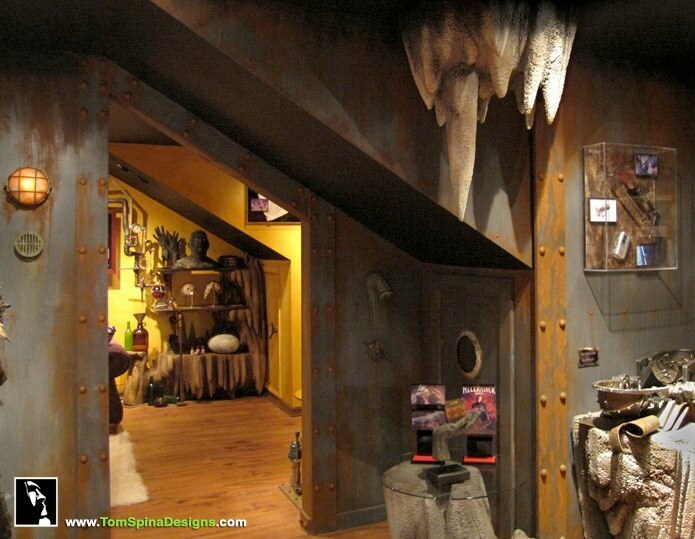 A literal custom man cave with faux rocks and theme-park style decor! 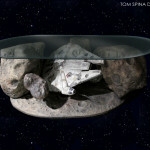 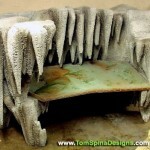 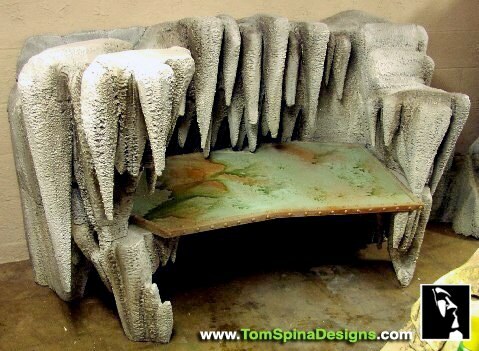 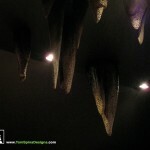 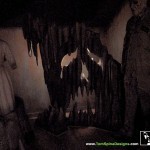 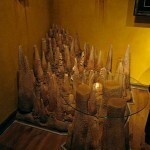 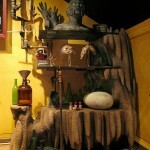 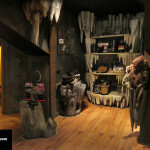 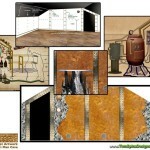 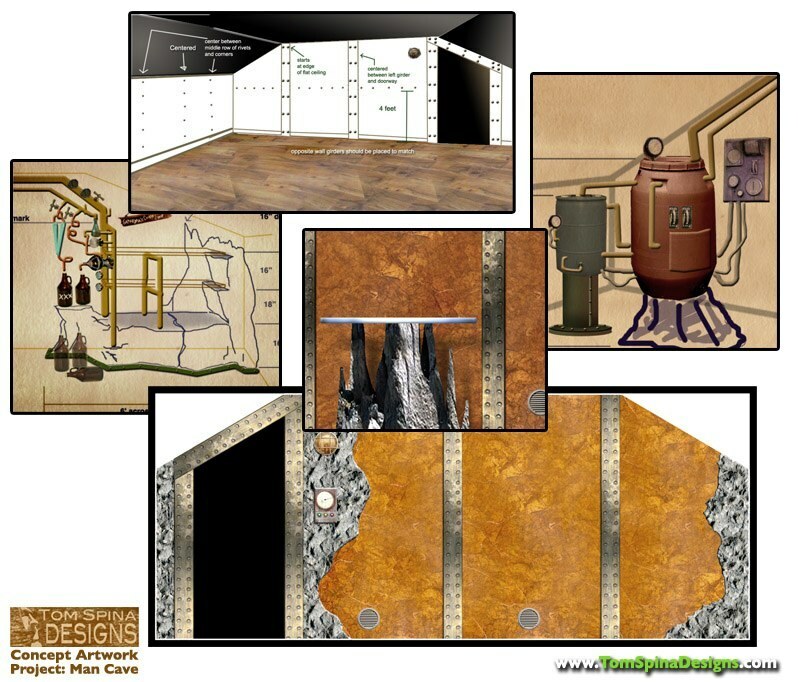 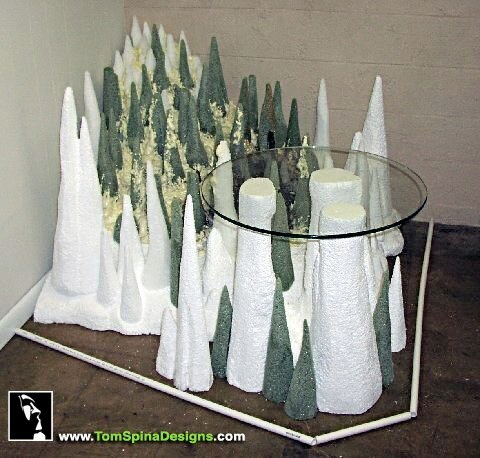 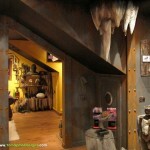 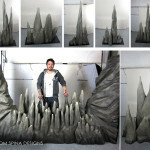 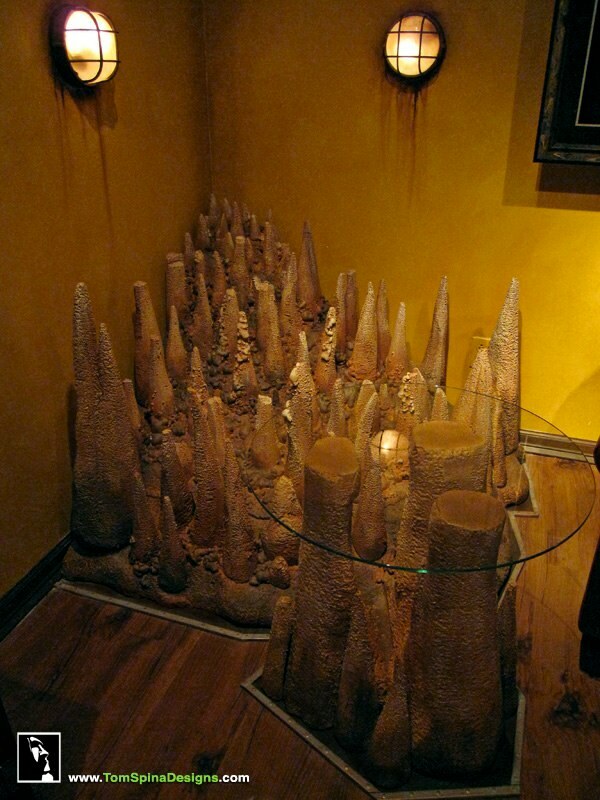 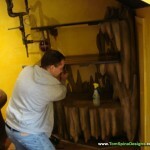 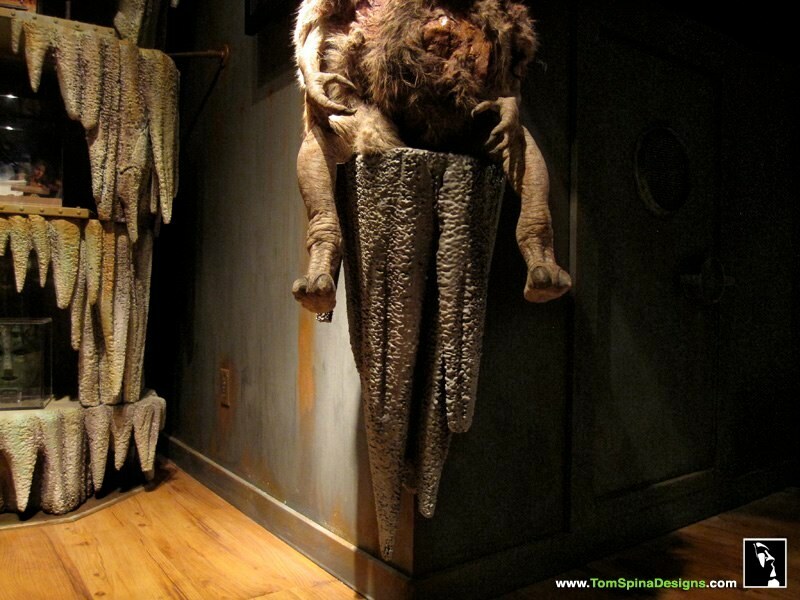 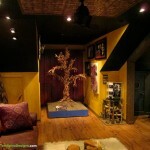 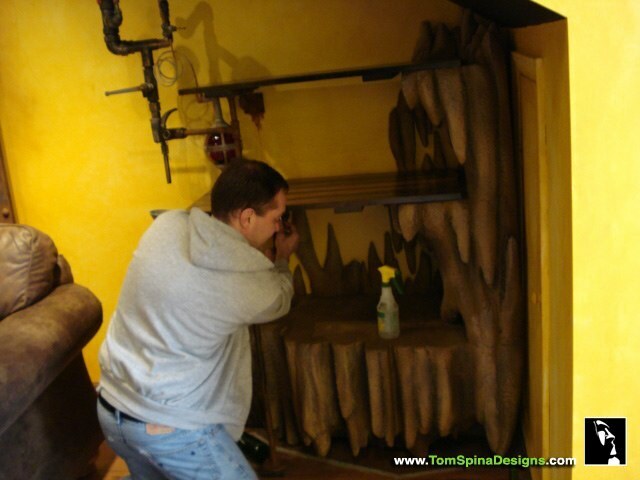 When movie prop collector (and long-time Tom Spina Designs client) Wesley Cannon told us his dream of having rooms in his home themed like an actual cave, we couldn’t pass up the opportunity to take a more literal approach to the phrase “Man Cave.” The result is a pair of richly themed and incredibly unique rooms in his new home, based on a concept that gives the feel of rooms built inside of a cave by some great adventurer many years ago. 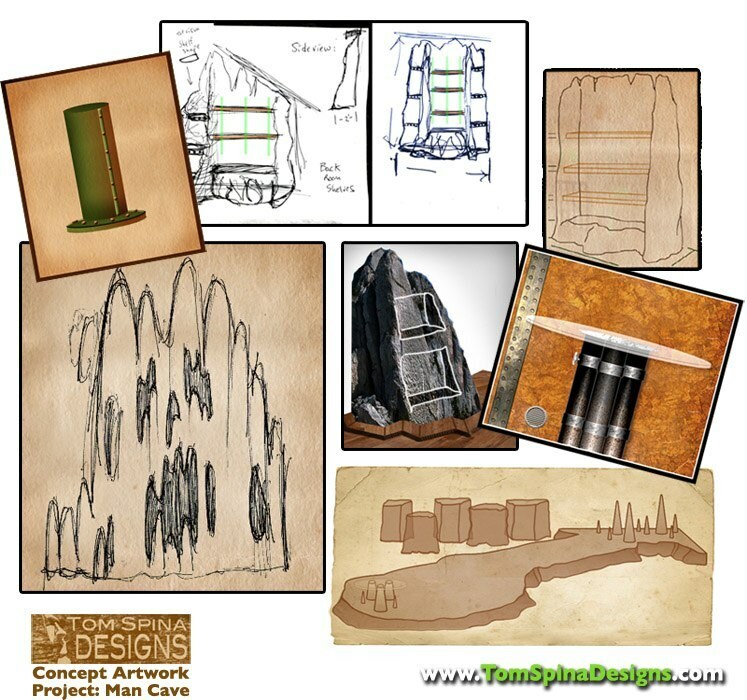 The rock formations each have a character of their own, as if our adventurer found certain formations interesting and built around them. 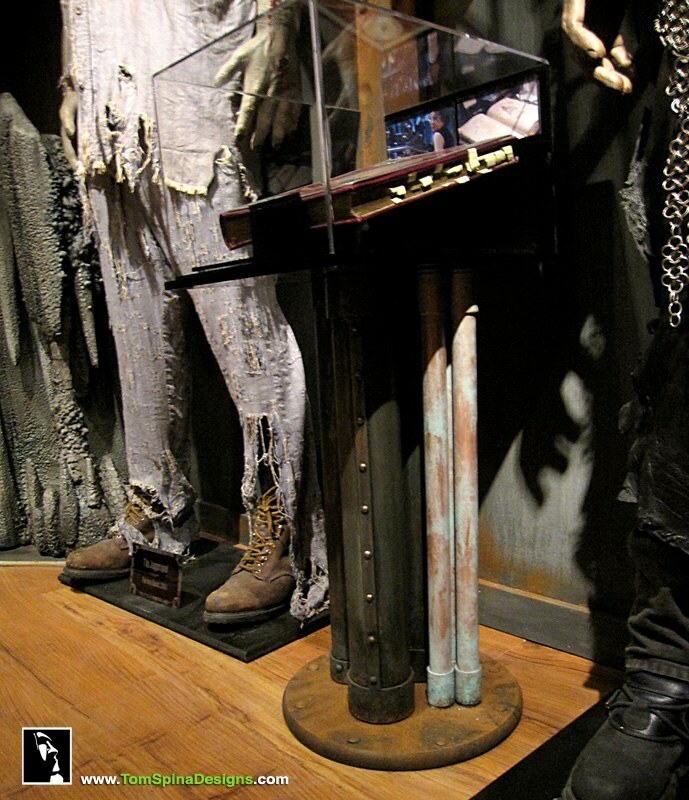 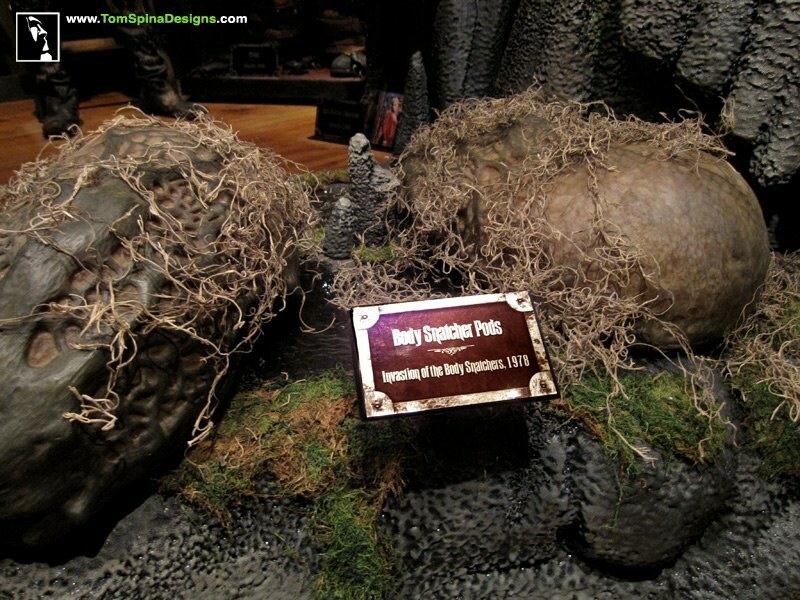 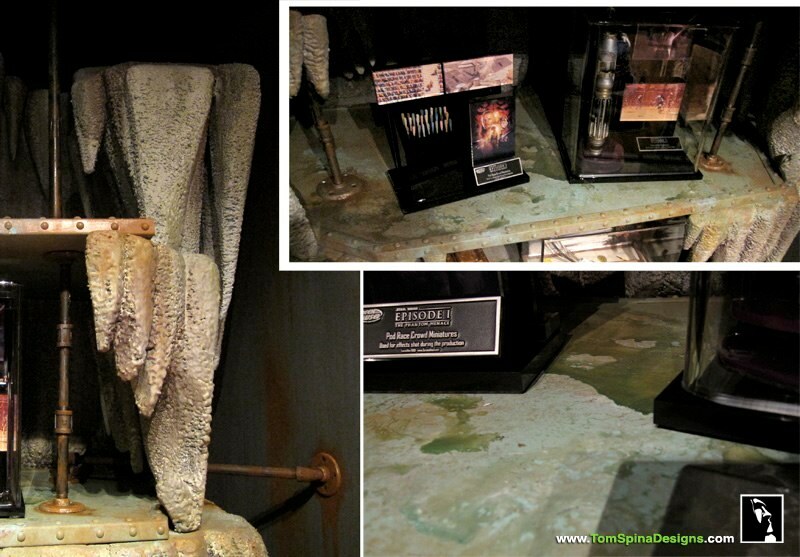 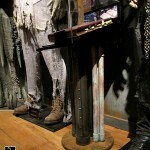 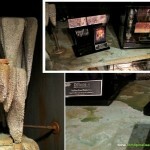 THE MOVIE PROP DISPLAY ROOM is the “outer room” – imposing, gritty and dark, full of rusted metal and craggy gray foam rock formations. 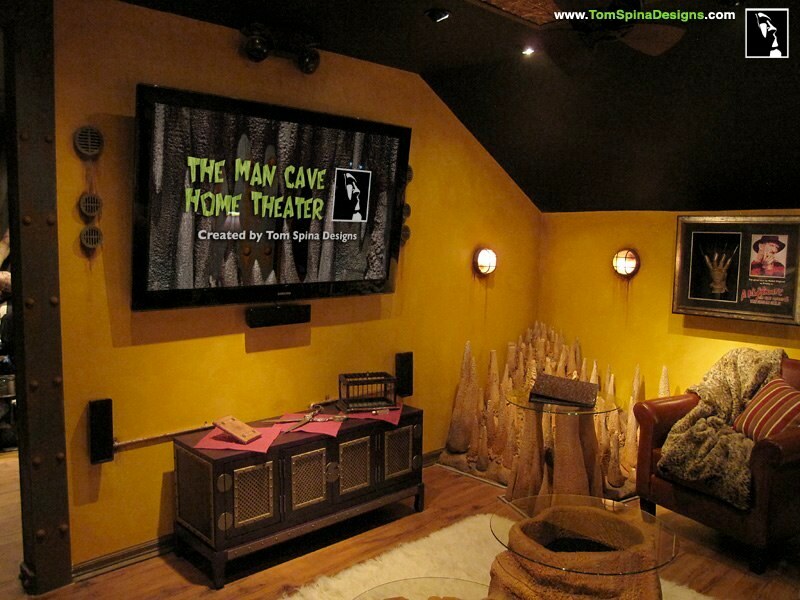 THE HOME CINEMA / MEDIA ROOM is the “back room” – warmer, with a tuscan-look wall treatment, beautiful brown foam rock work and layers of texture and detail. 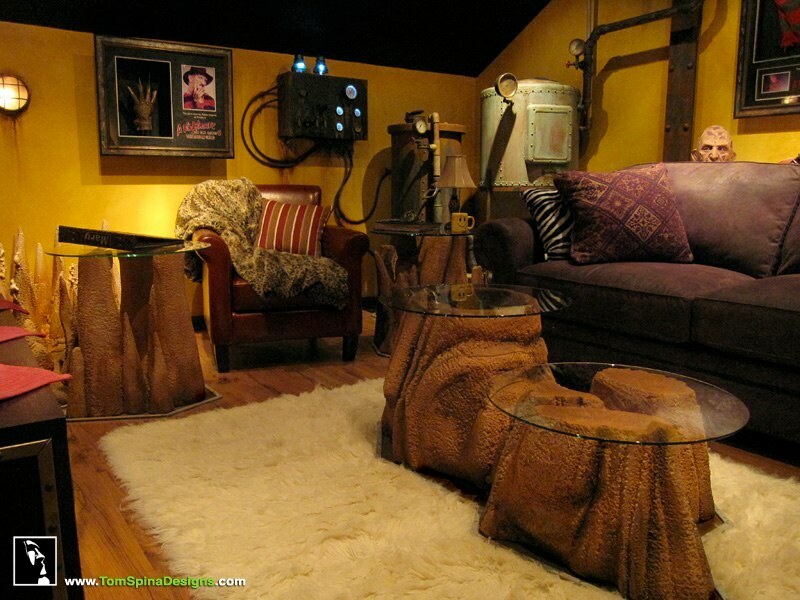 Both rooms fit the overall “cave” theme, but each with its own distinct feel. 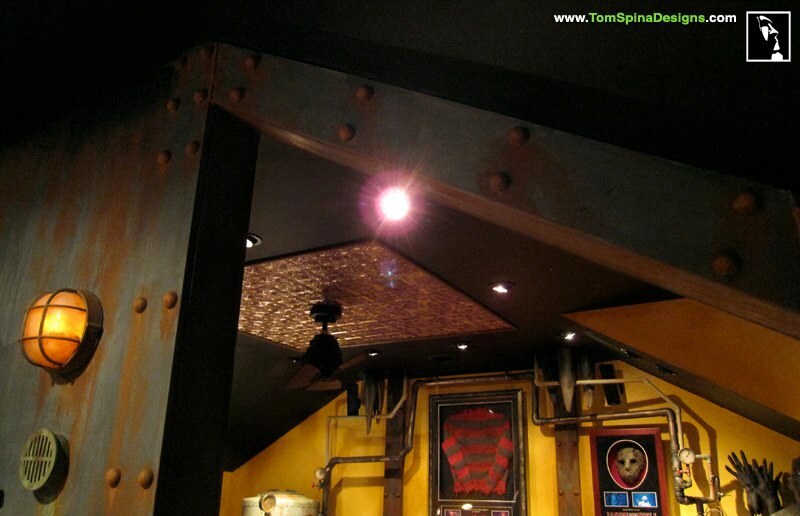 Repeating elements like girders, light fixtures and grates hold the theme together and visually link the two rooms. 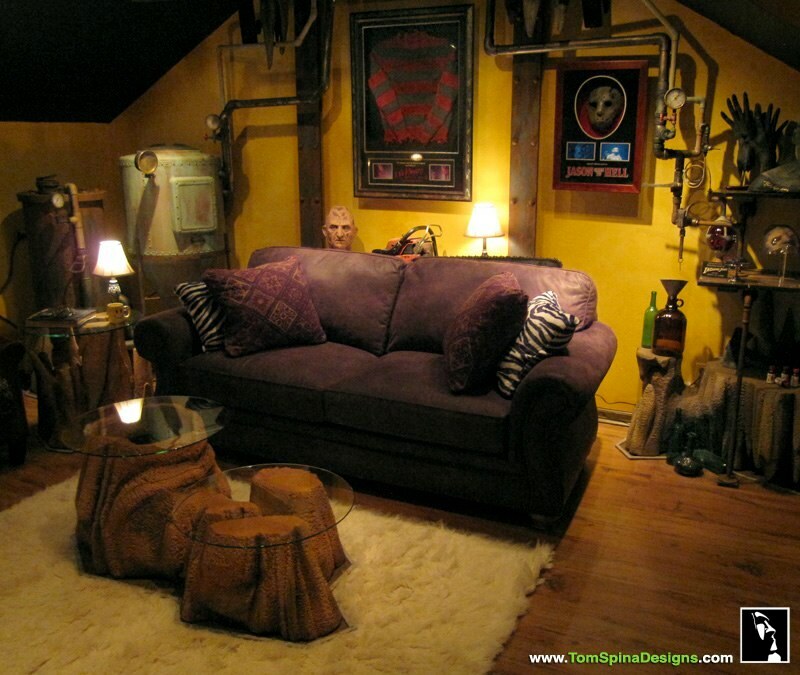 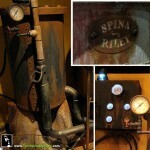 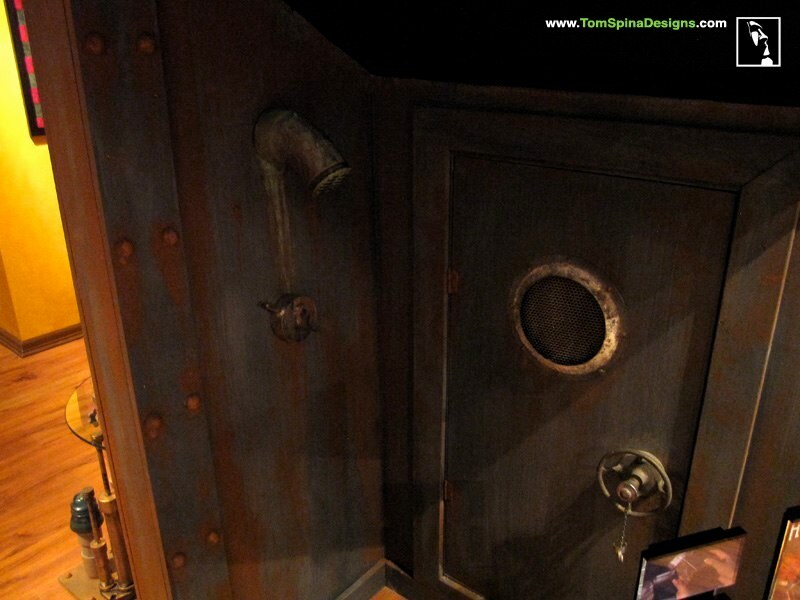 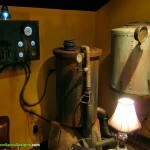 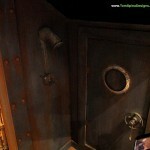 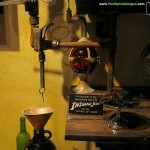 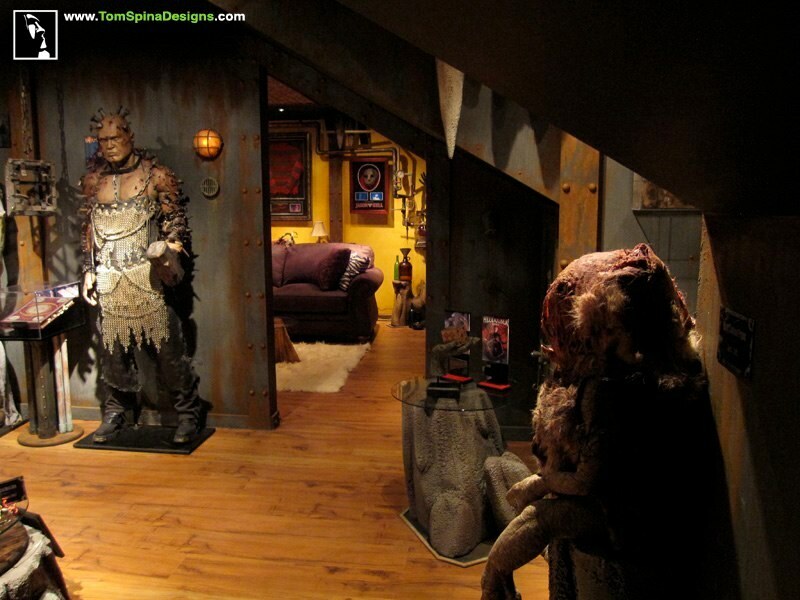 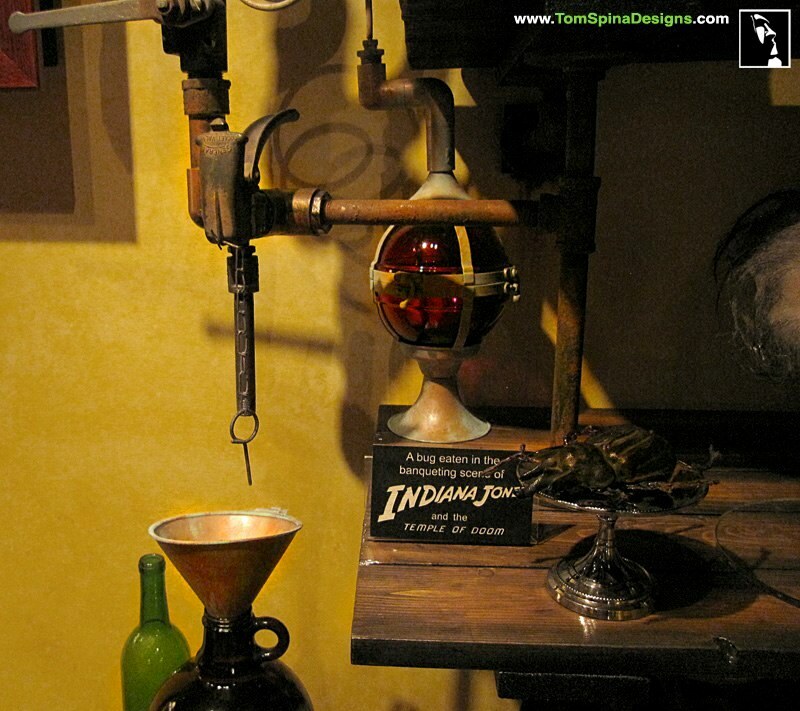 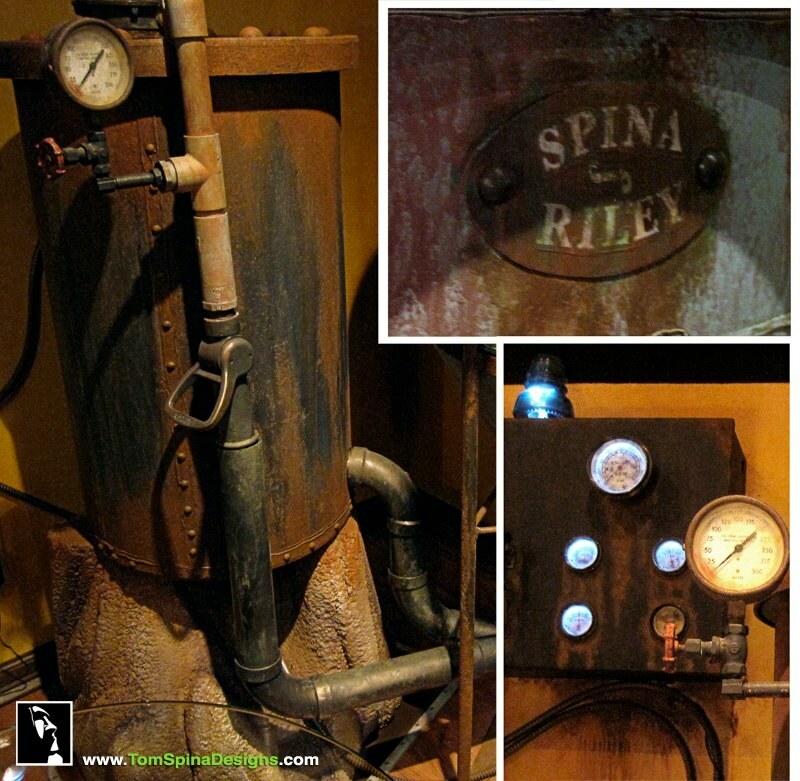 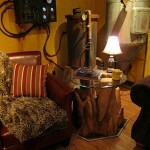 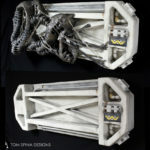 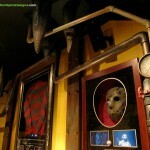 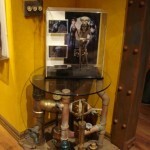 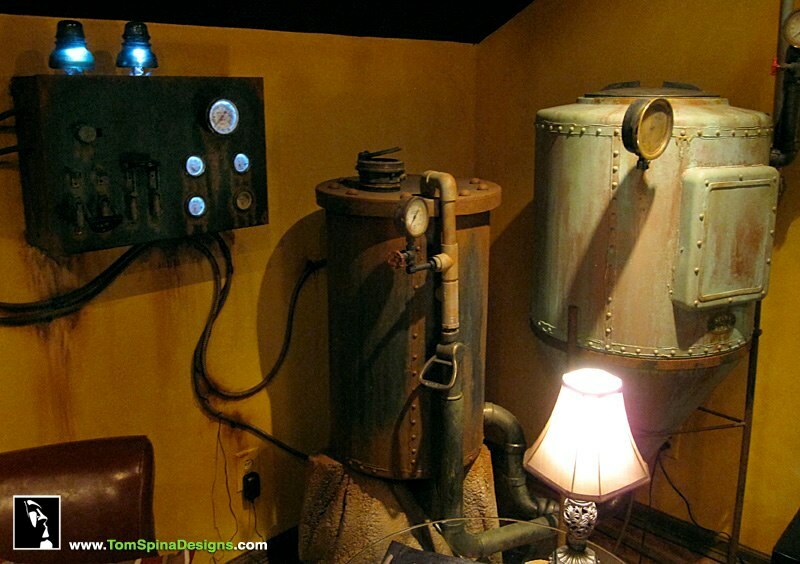 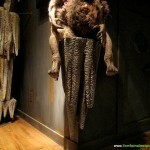 Both rooms feature a touch of chunky steampunk elements (something we call “steamchunk”) which we feel compliments Wesley’s horror props nicely while adding another layer of interest and style to the overall design. 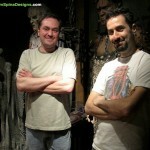 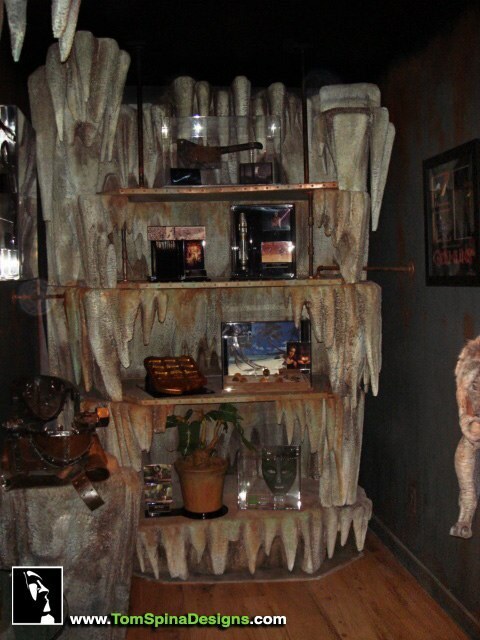 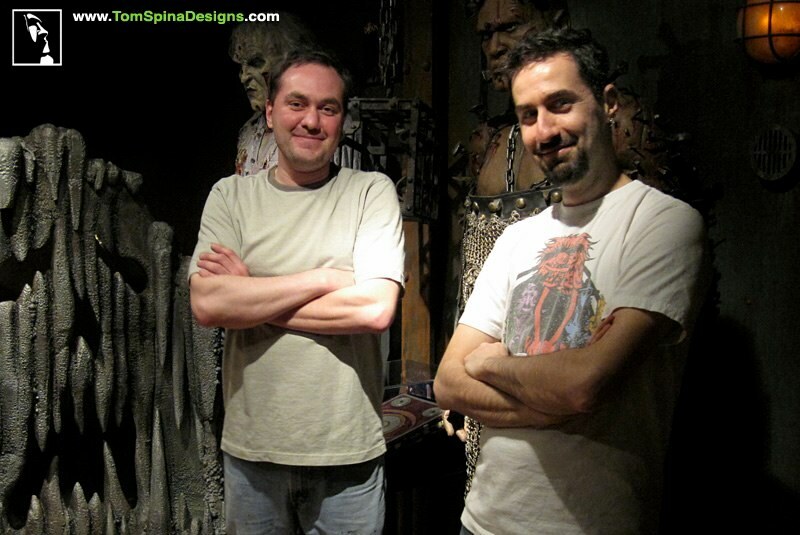 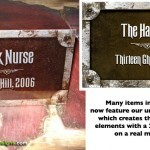 Wesley’s impressive collection of movie props, wardrobe and memorabilia is showcased in both rooms of his custom man cave. 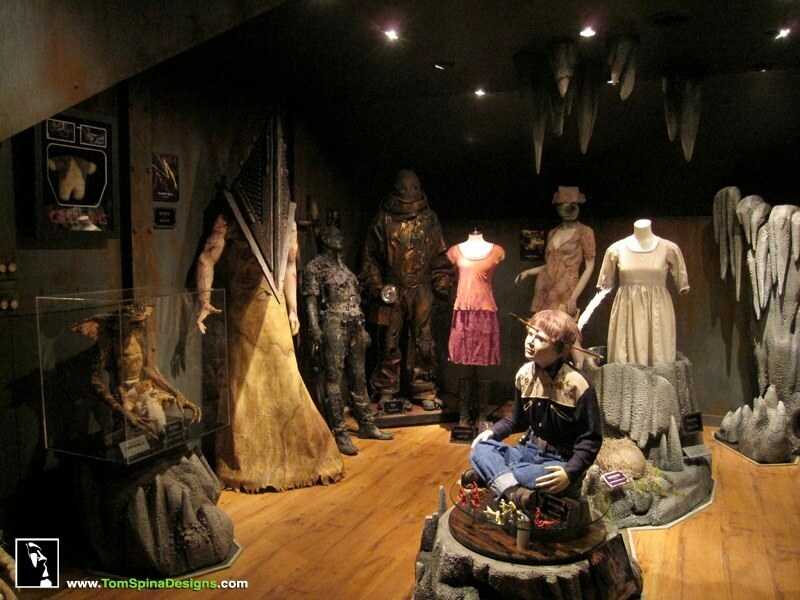 Mannequins and props were sorted based on theme and placed so that they all feel entirely natural in their new environment. 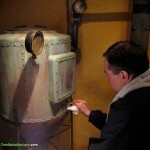 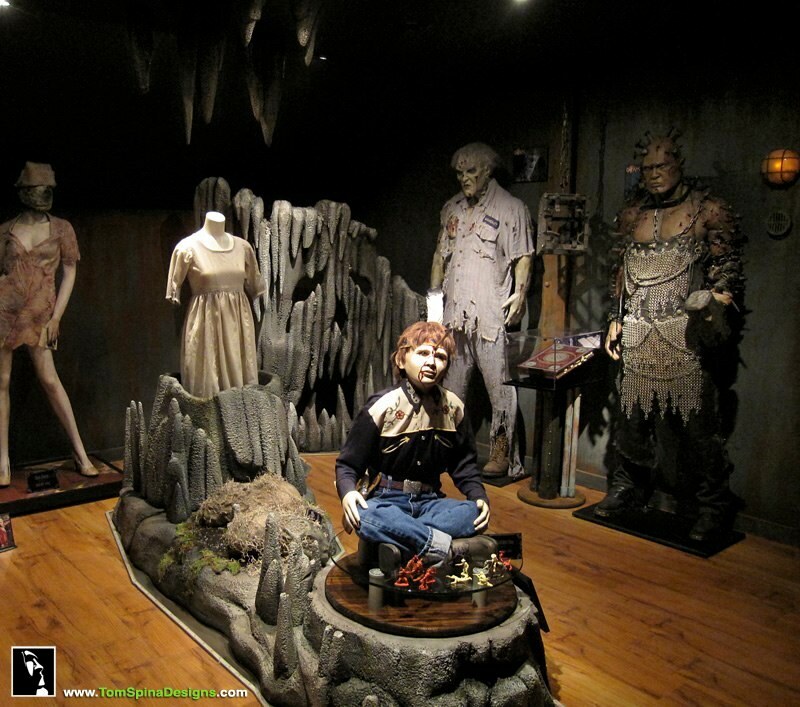 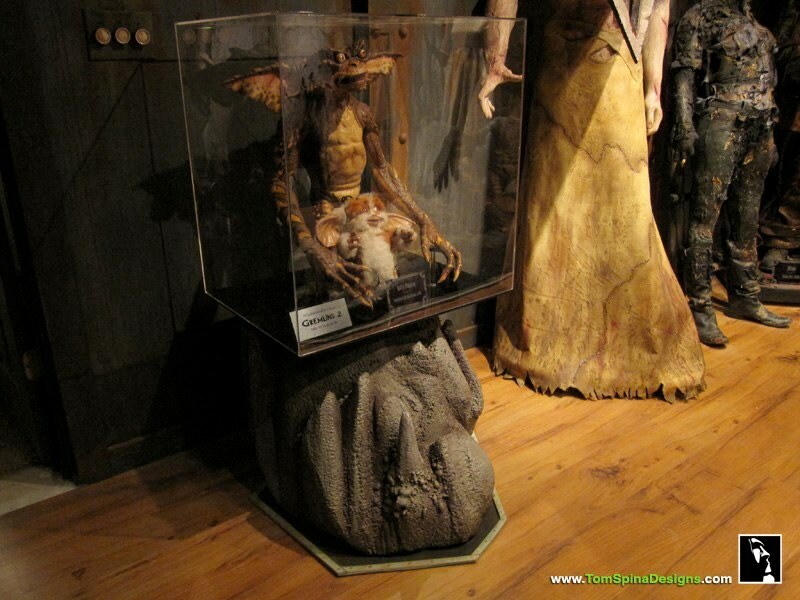 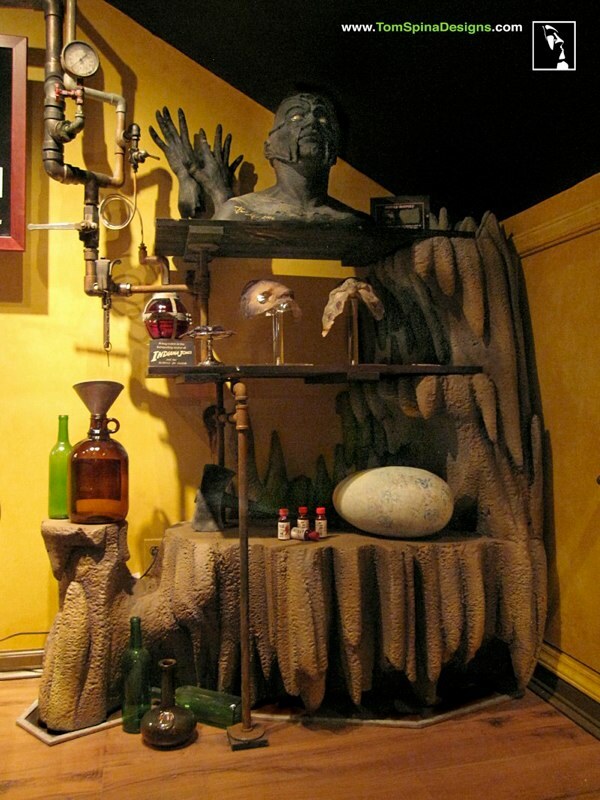 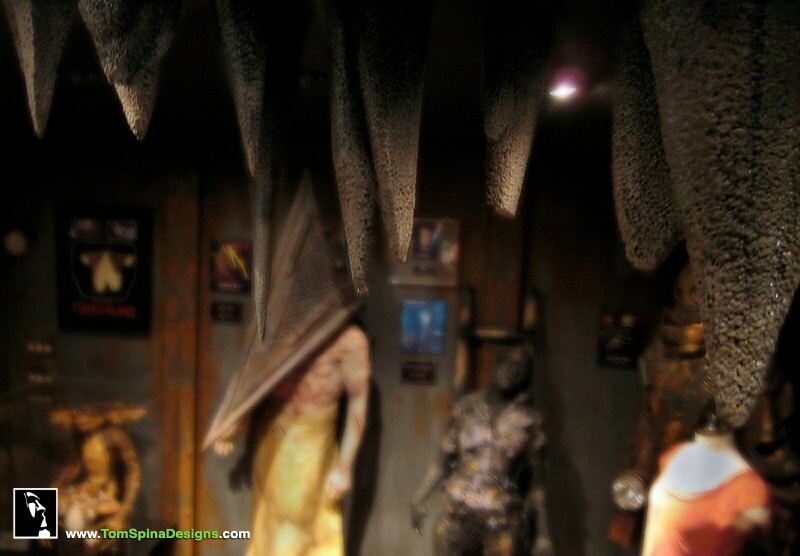 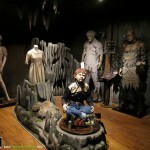 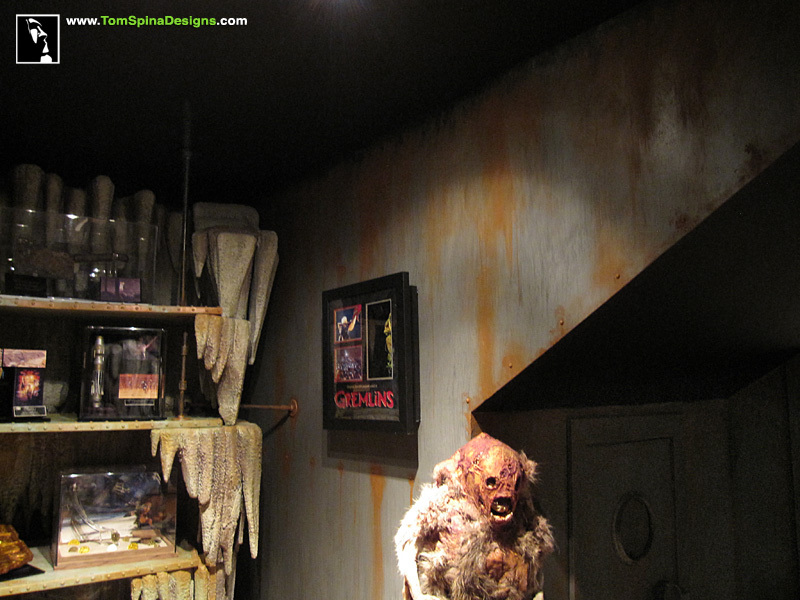 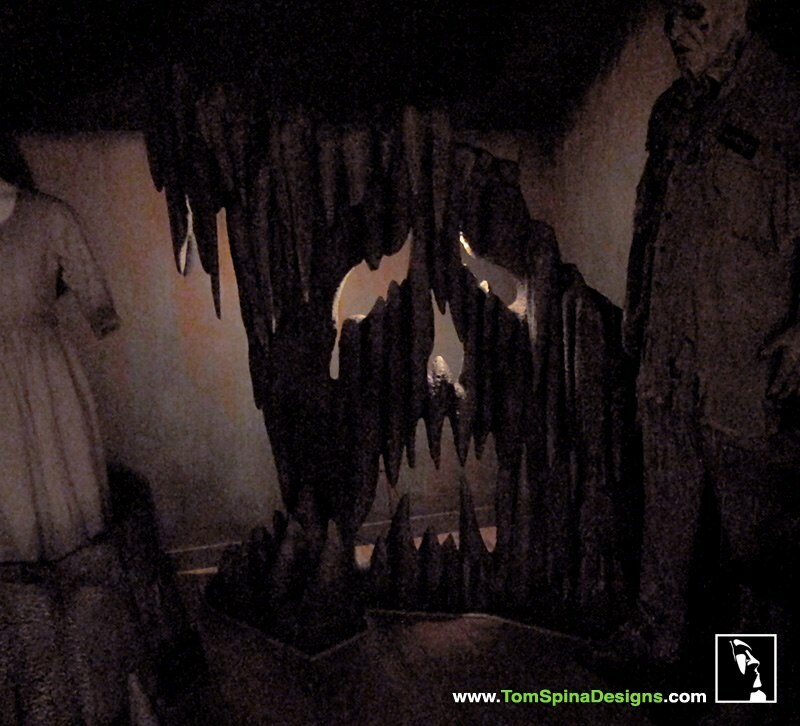 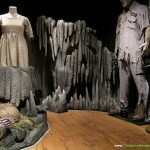 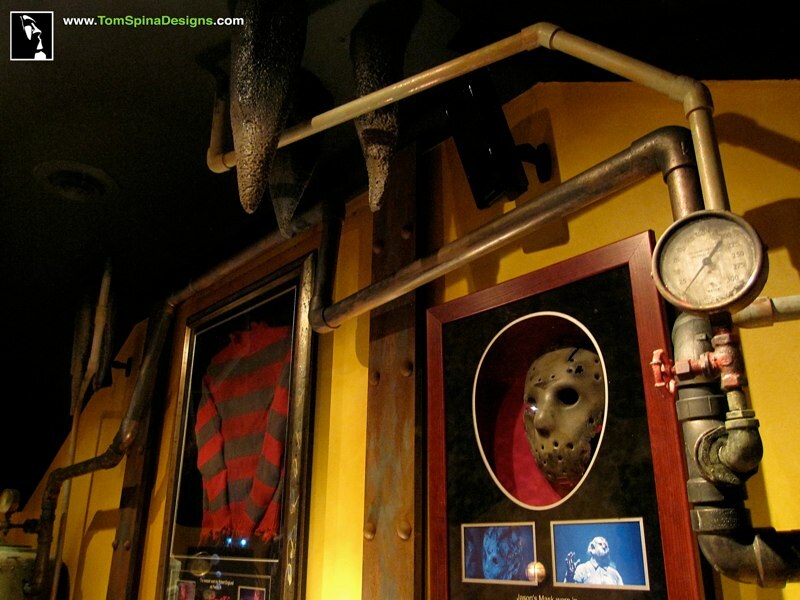 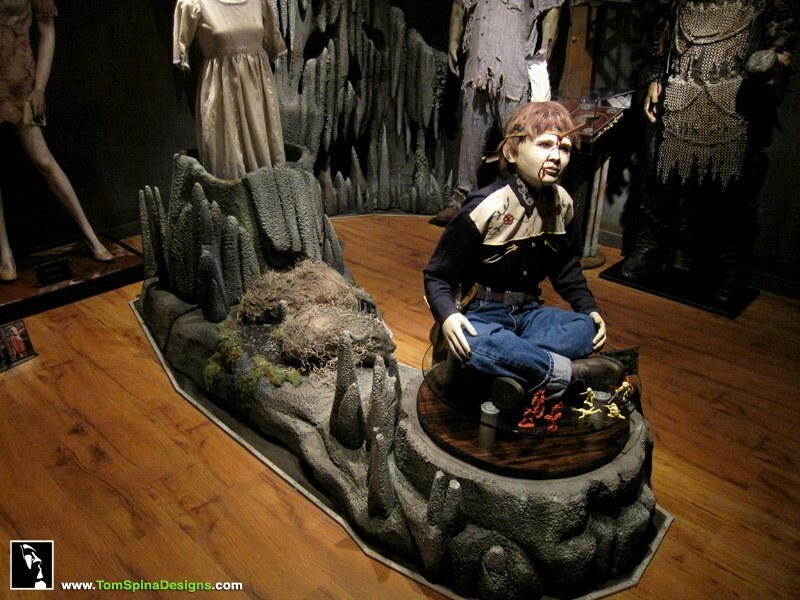 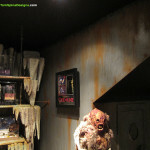 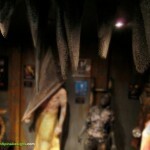 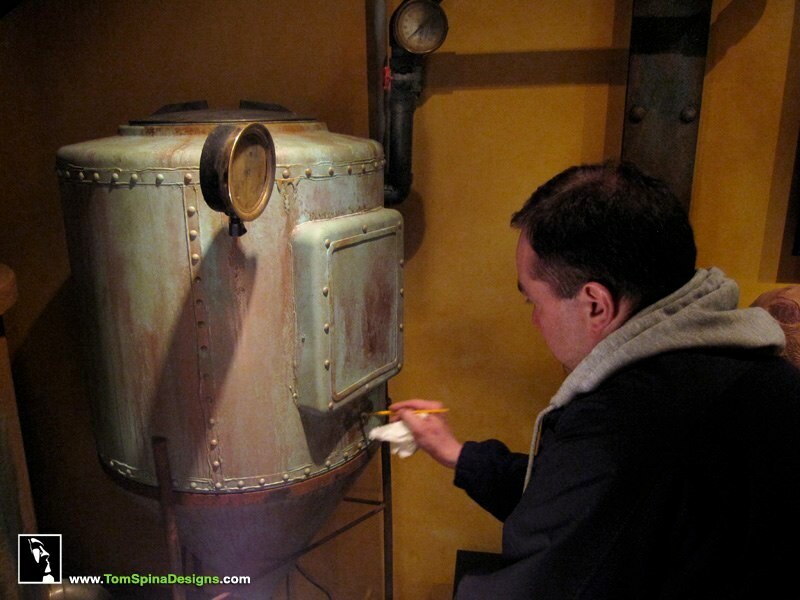 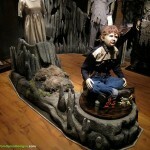 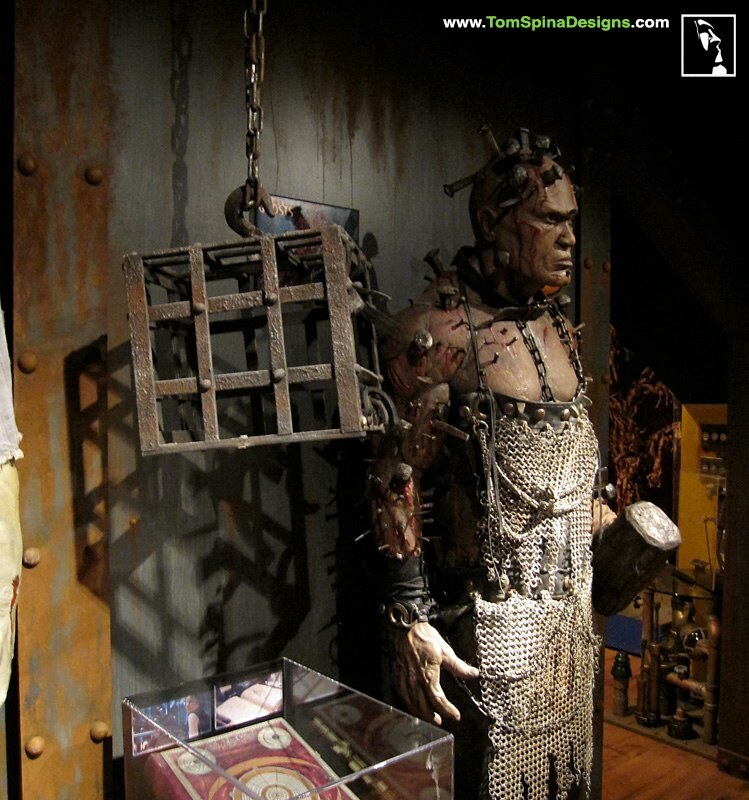 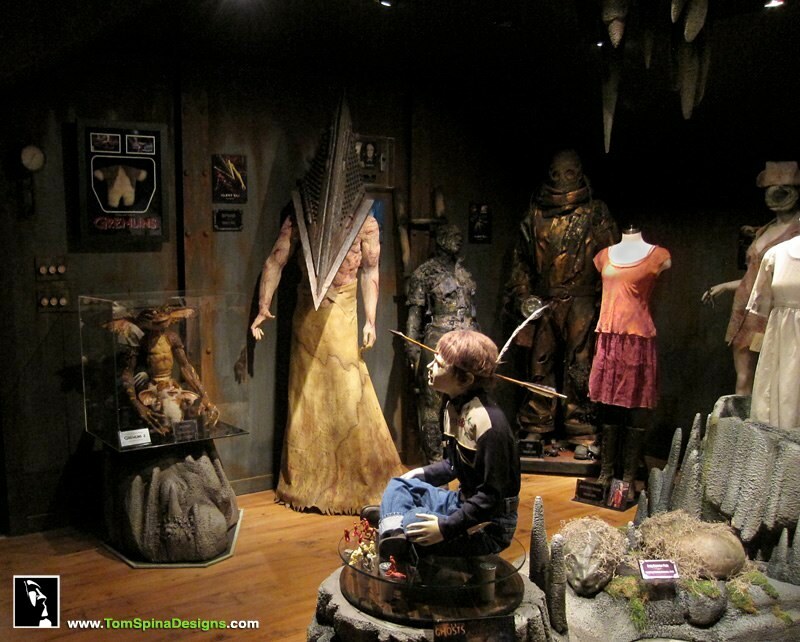 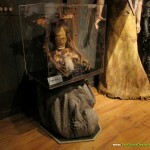 The MOVIE PROP DISPLAY ROOM draws inspiration from the horror genre and is primarily a “museum” space to display the bulk of Wesley’s incredible collection of original movie props and wardrobe. 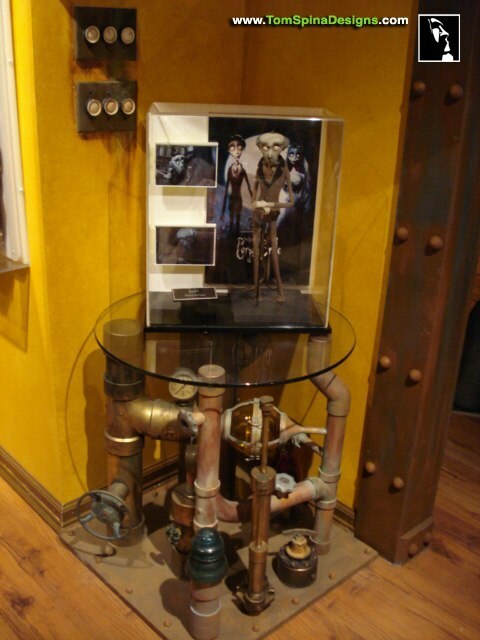 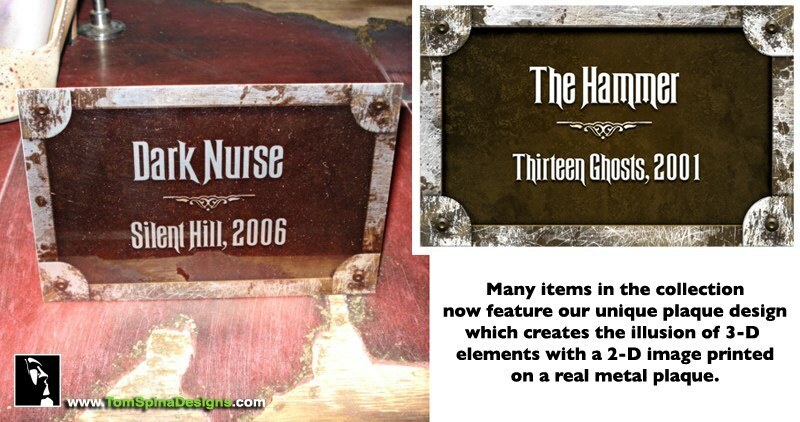 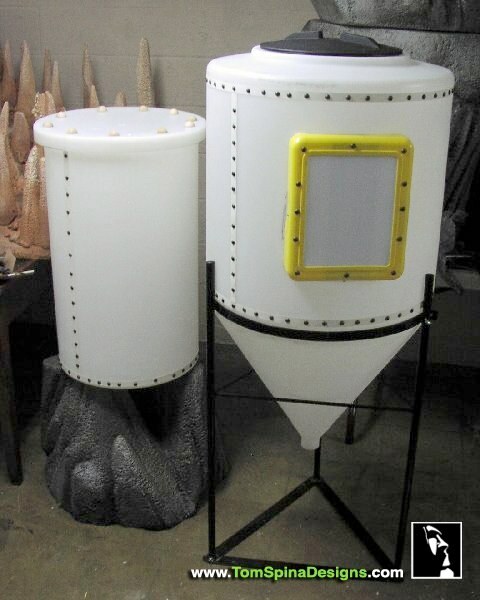 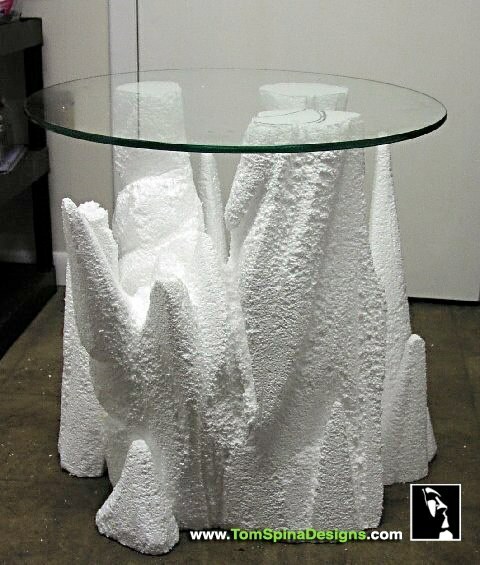 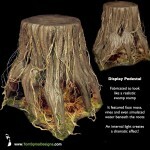 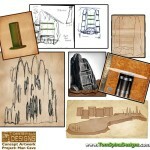 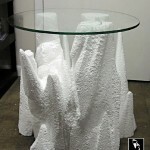 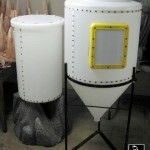 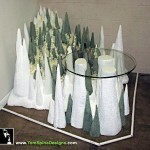 Our work needed to compliment and enhance the display of these pieces and not outshine them. 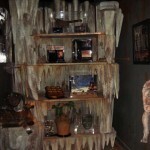 This room is meant to feel cooler and everything has age – a sense of weather and time. 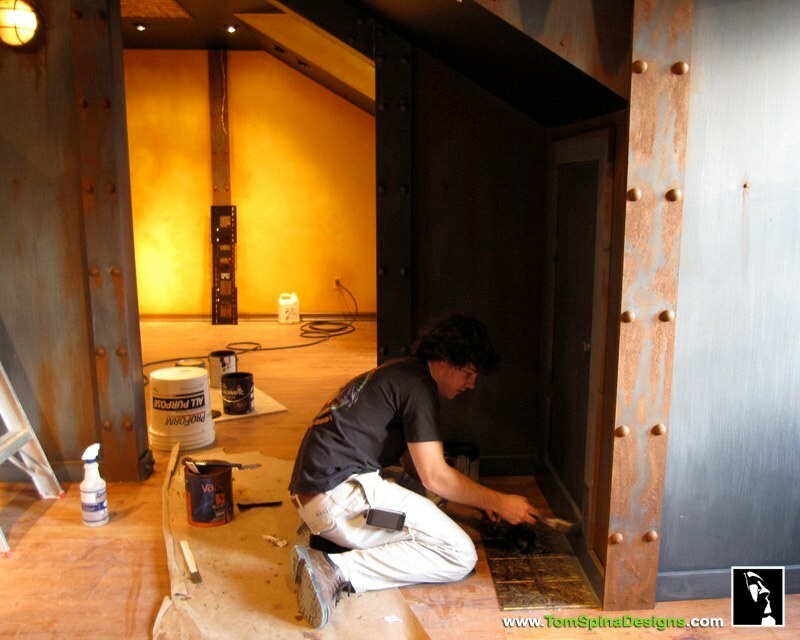 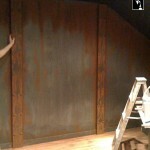 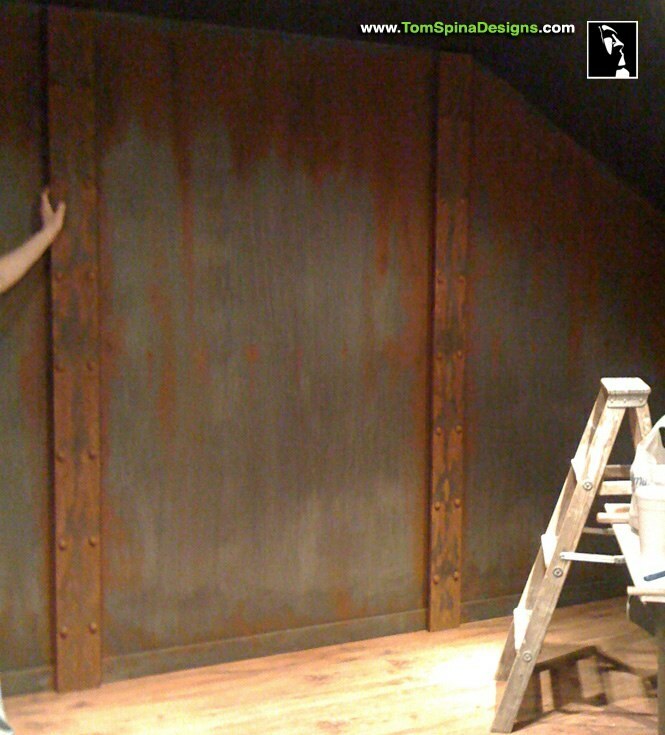 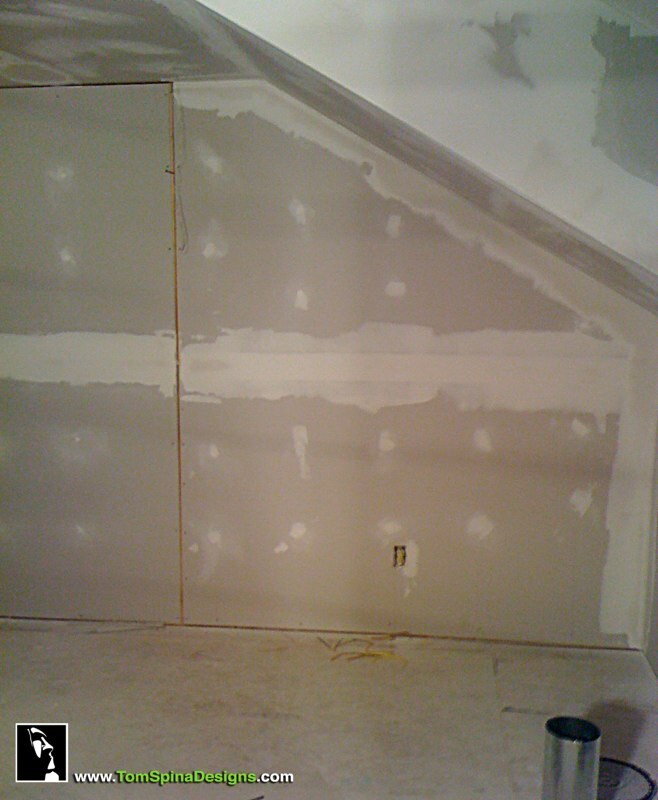 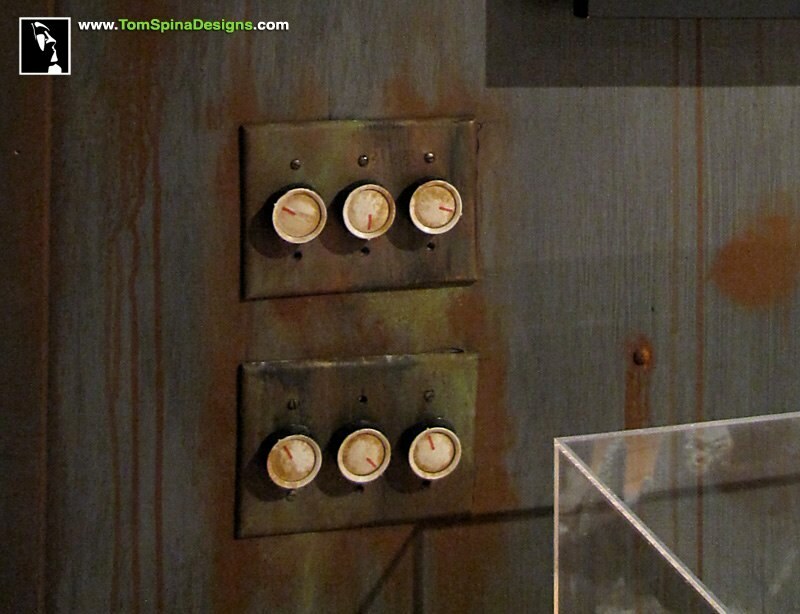 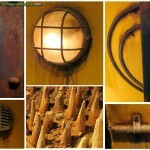 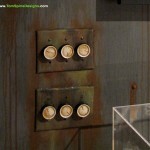 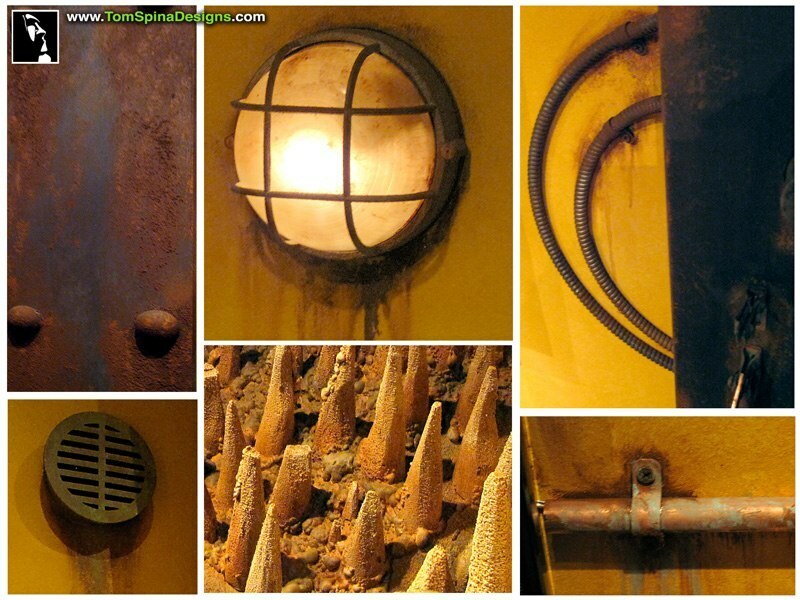 Walls in this room were treated to look like old, rusted metal plates, with rivets and layers of rust and dirt. 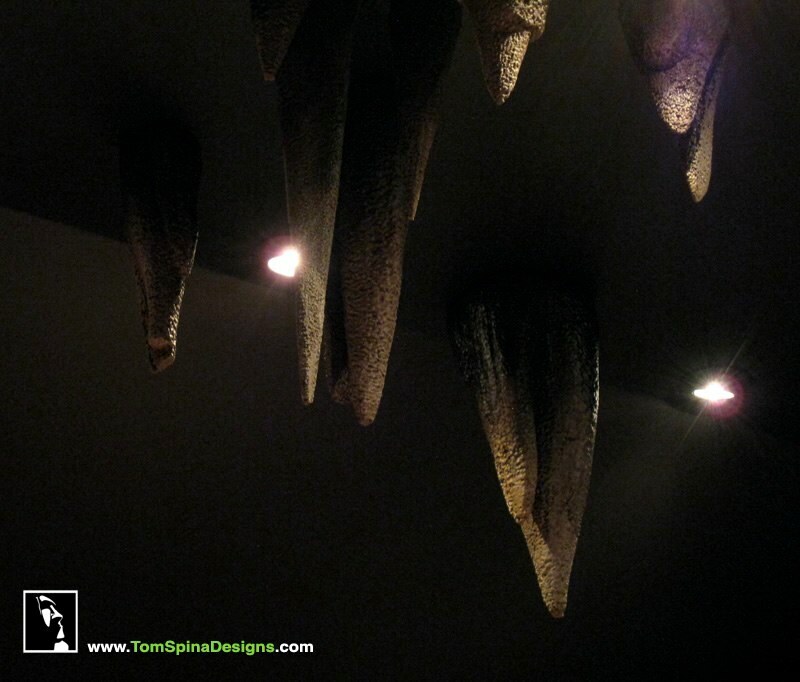 Dramatic lighting and paint treatments like a fade-to-black at the tops of the walls and stalactites, make the ceiling disappear adding an ominous feel. 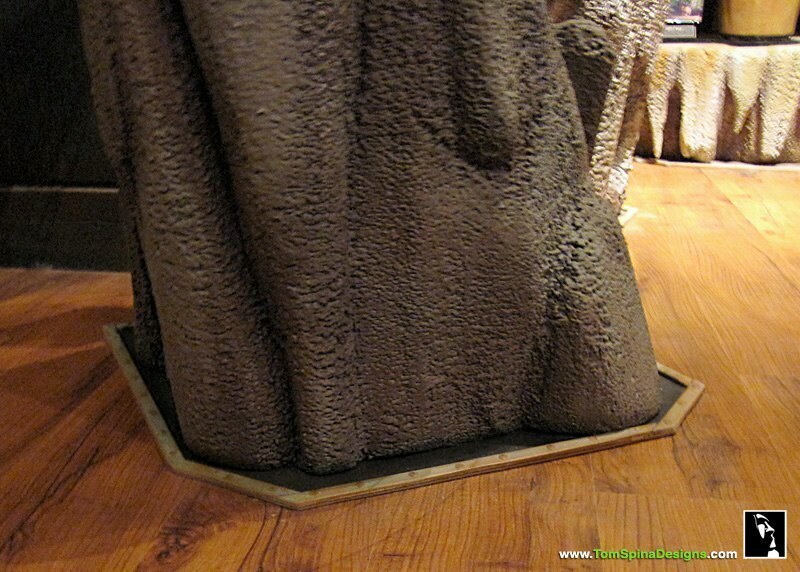 Riveted faux copper strips of floor trim around the base of all our custom sculpted rocks give the impression of the wood floor being cut out around “existing” rock formations, reinforcing that layer of story and making these pieces seem a part of the room while remaining movable. 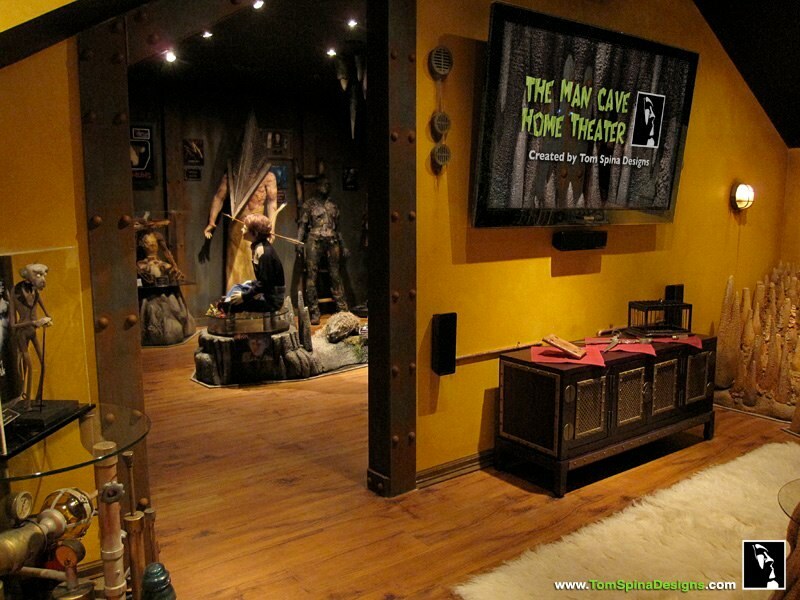 THE HOME CINEMA / MEDIA ROOM feels much more warm and “indoor”. 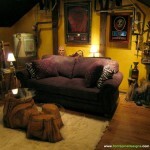 A relaxing sanctuary from the outer room, we nicknamed this space the “Captain’s Quarters” early in the process. 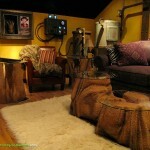 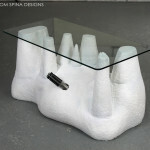 Comfortable furniture, custom sculpted tables and shelves and layers of texture detail help create the proper atmosphere. 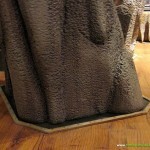 The faux rocks in this room intentionally have more warm brown tones vs. the gray of the front room. 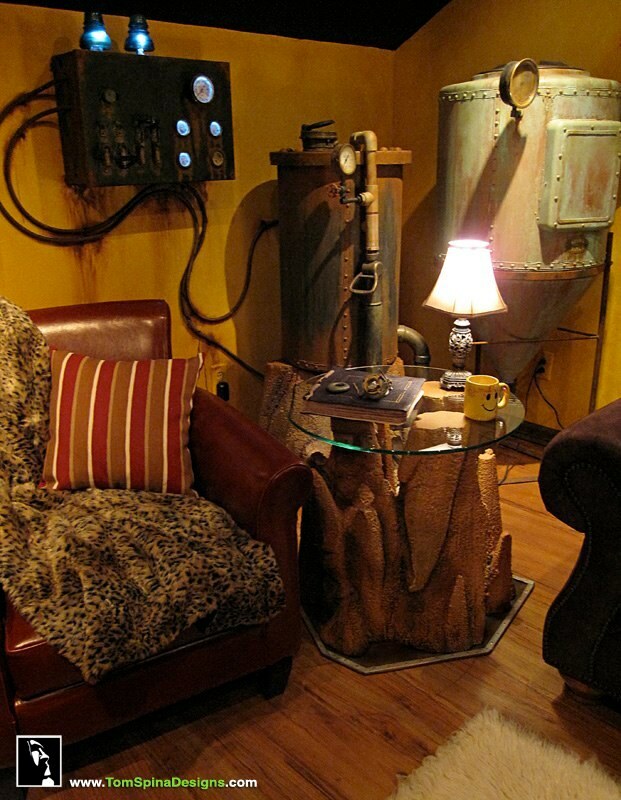 Stalactites mingle with pipes in the back ceiling and a pair of old boilers look ready to keep things toasty. 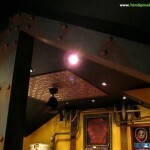 Girders and other elements bridge the visual “feel” of the two rooms and unify them. 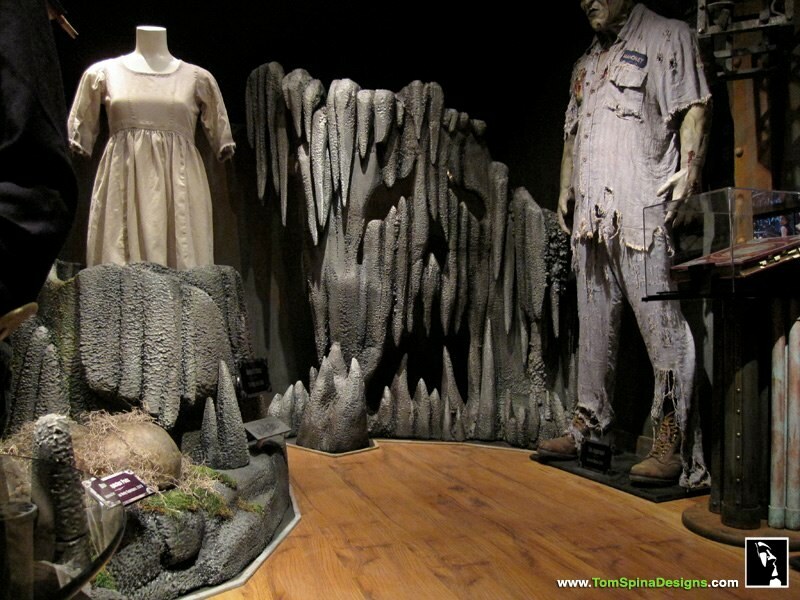 In both rooms, riveted metal strips around rocks give the impression of wood floor being trimmed out around “existing” rock formations. 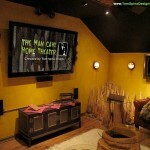 A giant 62″ Samsung HDTV makes a big impact on the viewing wall! 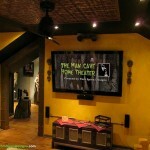 A Samsung sound system rounds out the home theater elements. 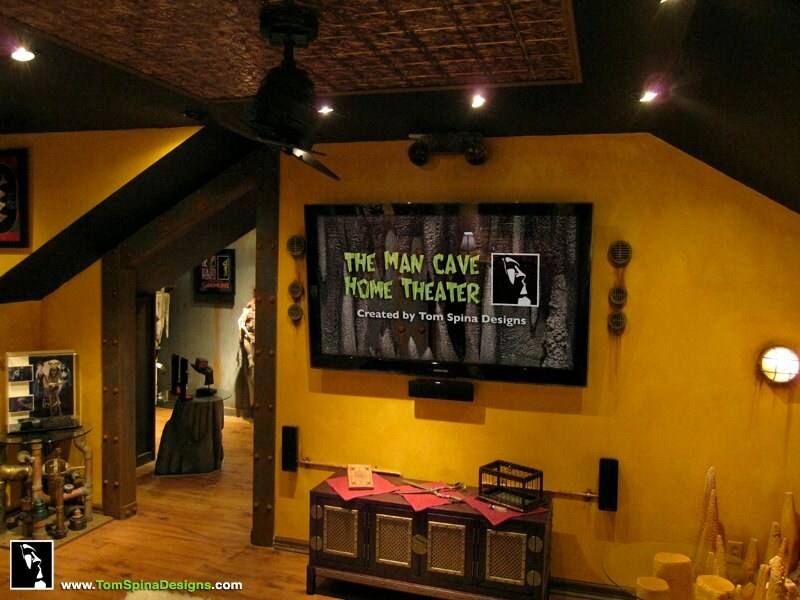 Are you looking for your own one of a kind, movie themed home theater, home cinema or man cave? 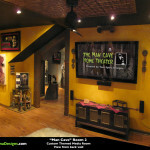 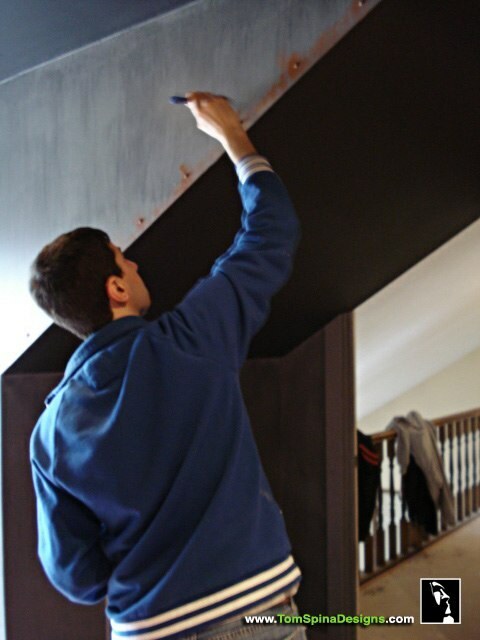 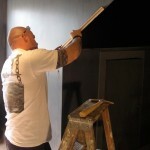 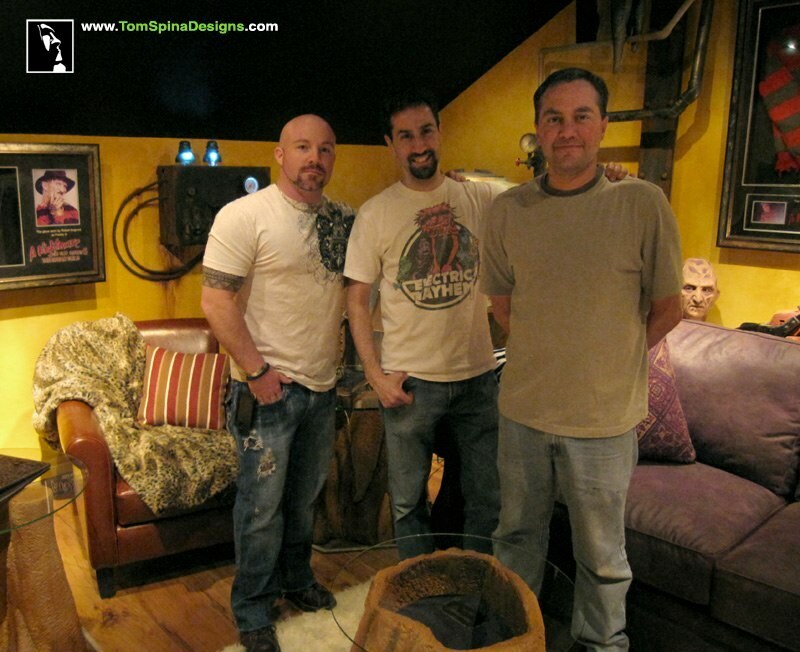 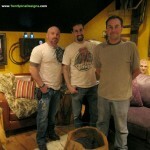 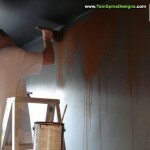 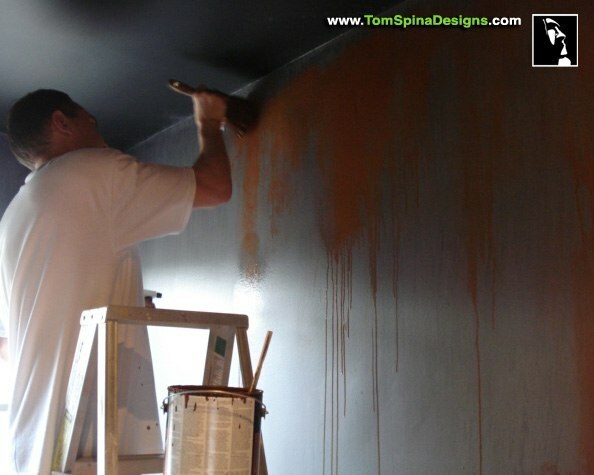 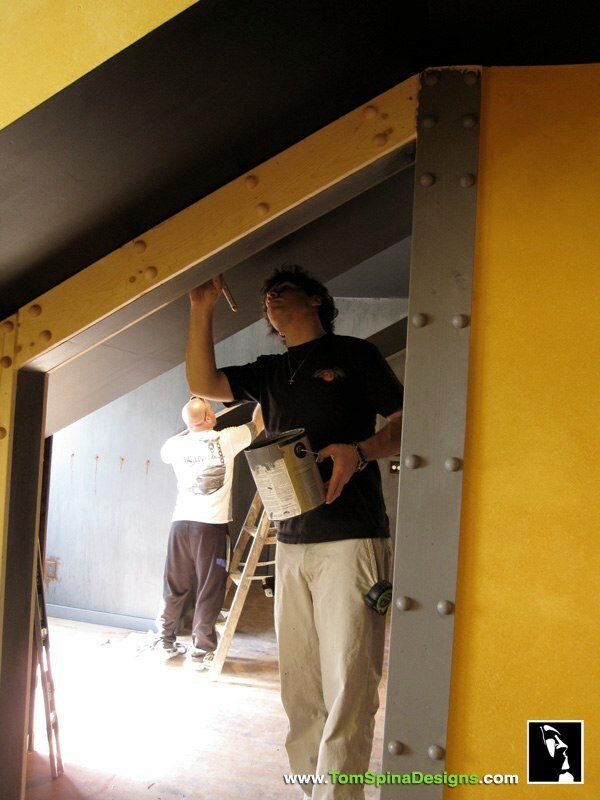 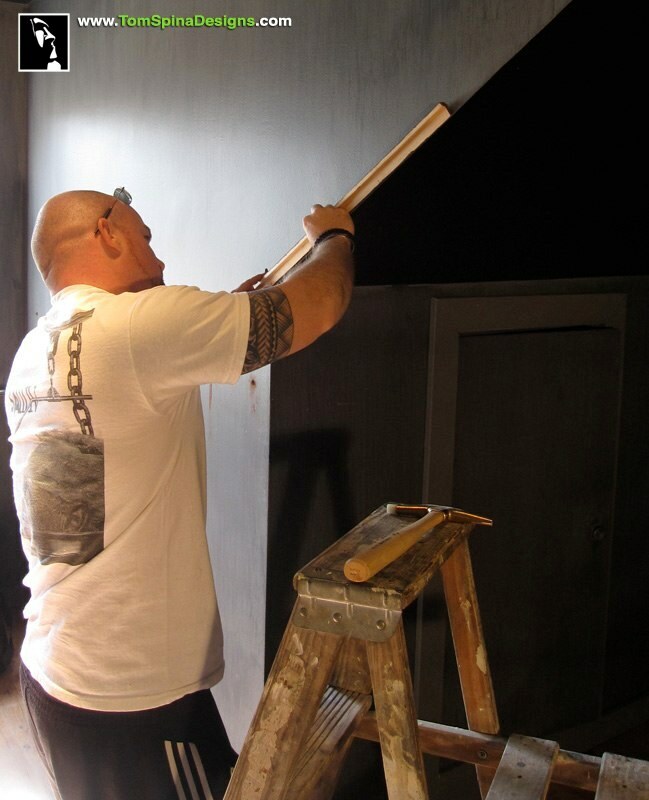 Check out this video about how we created this amazing man cave!